There are many ways in Italian cookery to put up food, relics of the days before refrigeration and freezing and commercial processing. There is straight up canning, of course. I can remember Angelina’s yearly day-long ritual of putting up summer tomatoes for the winter. The mason jars nearly filled one of the closets of her New York apartment. I haven’t covered that on this blog yet, but you will find posts on the similar process of making passata di pomodoro at home. There are other, slightly more elaborate techniques in Italian cooking for preserving vegetables: one called sott’olio, uses olive oil to seal off the ingredients from the air, while the other, sott’aceto—essentially pickling—uses vinegar’s antimicrobial properties to help ward off spoilage. Fruits, on the other hand, are generally preserved with sugar, a technique illustrated in our post on making cherry preserves. A good example of Italian style pickling is la Giardiniera. It brings together a cornucopia of the season’s bounty in a single colorful dish. 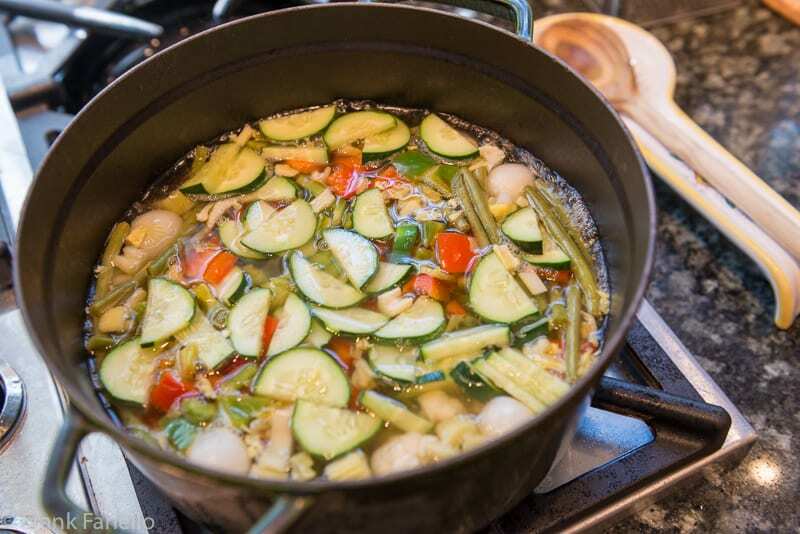 The various vegetables are simmered in a broth of equal parts white wine vinegar and water, seasoned generously with both sugar and salt, along with whole peppercorns, a bay leaf and other herbs if you like. Recipes vary on the seasonings, but you generally won’t find the mustard seed, dill or many other pickling spices so common in our pickles and relishes. The vegetables are added to the pot according to their hardness, so they cook evenly. The choice is your—after all, this recipe was all about preserving whatever excess produce you had on hand—but the most common ones are given here. The amounts here are notional, enough to fill two medium-sized mason jars, but the amounts can be easily doubled or tripled if you want a larger supply. Giardiniera makes a fine antipasto, on its own or as part of a platter with cured meats and cheeses, or as an accompaniment to grilled or roasted meats. It also often makes its way into rice salads or potato salads as well. Cut the cauliflower into flowerets, then cutting any very large flowerets into 2 or even 4. Slice the carrots into rounds, not too thinly. Slice the celery across the grain. Trim the spring onions aof their roots and most of their green tops, then if large, slice them vertically in 2 or even 4. If using pearl onions, peel them and leave them whole. If they’re fresh, they should be very easy to peel, otherwise you can blanch them for a minute or two to loosen their skins. Trim the green beans but otherwise leave them whole. Slice the bell peppers into strips or bite-sized squares, as you prefer. (See our post on trimming and slicing peppers for details.) You should slice the cucumbers, like the carrots, into fairly thick rounds or, if they are big, into bite-sized cubes. You can then lay out your veggies on a cutting board. Bring all the ingredients for the poaching/preserving liquid to a simmer. 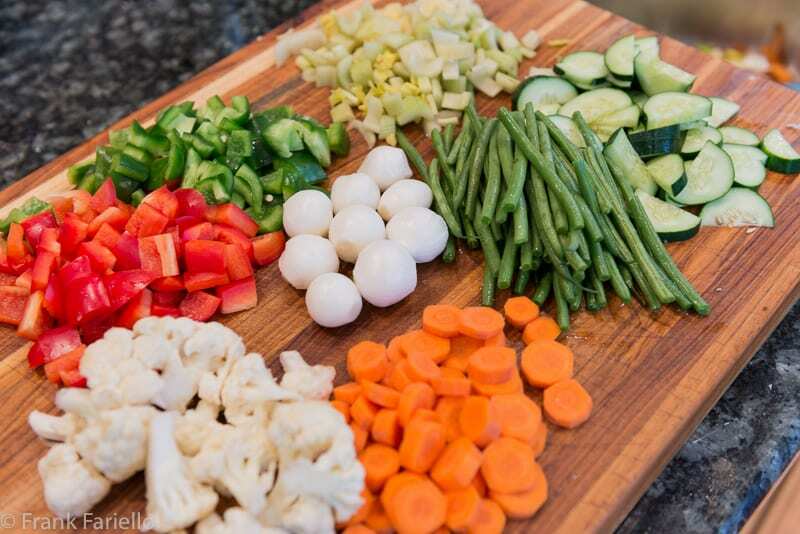 Add the vegetables in the order listed, beginning with the cauliflower, carrots and, if using, pearl onions. Let them simmer for 3 or 4 minutes, then add the green beans, spring onions, celery, peppers and cucumbers, in that order. Let each come to a simmer before adding the next. Simmer everything together for another 3 or 4 minutes, until the vegetables are crisp-tender. 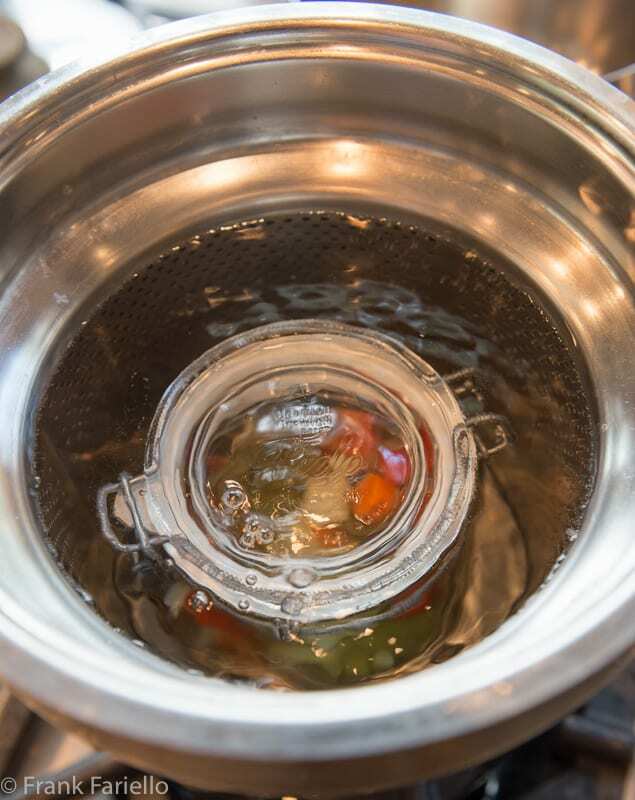 With a skimmer, transfer the vegetables to a colander to drain, then on to a large baking sheet or other flat surface to cool, reserving their poaching liquid. Let that cool completely as well. In the meanwhile, sterilize the mason jars by steeping them in boiling water for 1o minutes. Carefully remove them from the water and let them dry. In the alternative, if your dishwasher has a sanitizing cycle, wash them using that cycle. Fill the mason jars with the vegetables, leaving a bit of room at the top. Pack them in, but not too tightly. Fill the jars with enough poaching liquid to cover all the vegetables. Most all-timey Italian recipes call for a much longer rest, at least two weeks, with most calling for a month or more’s rest before consuming your giardiniera. Makes sense. After all, this was originally a way to preserve fresh vegetables for the winter. Pour enough water into the pot to cover the jars amply. Bring the pot to the boil and let simmer for a good 20 minutes. If the process is working, you should notice some small bubbles emerging from the jars, which means that a vacuum is indeed forming inside the jar. Turn off the heat and let the jars cool off completely before setting them in a cool, dark place. 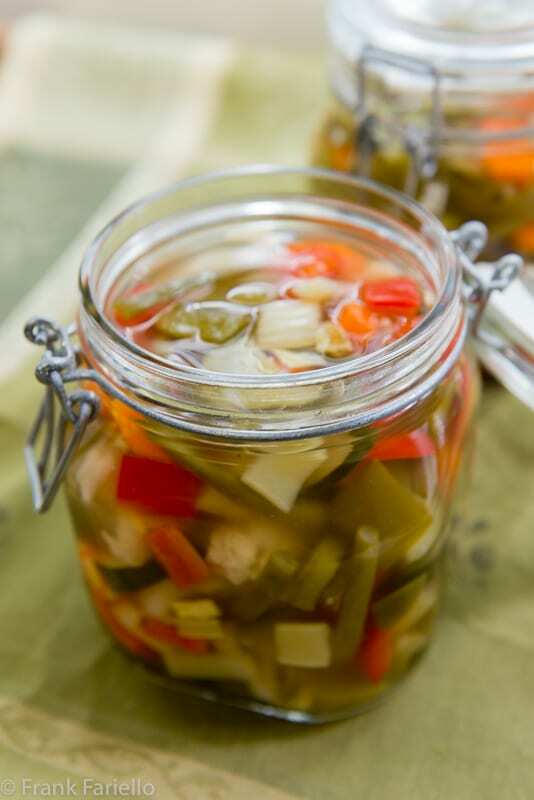 When making giardiniera for the long haul, many recipes will have you transfer the hot, just cooked vegetables and liquid directly into mason jars, rather than cooling them both off. In fact, that probably keeps things more sterile. However, that technique does risk overcooking the vegetables—cooling them when they’re just cooked to the right point ensures that perfect crisp-tender texture. The ingredients for a giardiniera are pretty consistent across recipes. The most typical vegetables are the ones given here. I’ve seen some recipes with other vegetables, including peas and even zucchini. Personally I’d stay away from the zucchini, which tend to turn mushy. As mentioned, you’ll generally not find lots of spices in a Italian giardiniera. A few recipes will call for cloves or juniper berries—let’s call these optional. The amount of sugar also varies tremendously—with some recipes leaving out the sugar altogether, others quite a bit to produce a noticeable sweet and sour flavor—in which case you’d have made giardiniera in agrodolce. Personally, I like just a pinch of sugar, just enough to slightly cut the acidity of the vinegar. In another variation, the mason jars, once filled with vegetables, are topped up with olive oil, following the sott’olio method, rather than the pickling liquid. Don’t confuse this original Italian version of giardiniera with the more strongly flavored Italian-American “Chicago-style” relish by the same name. Chicago-style giardiniera is heavily seasoned with garlic, oregano and red pepper flakes. It includes olives and sometimes jalapenos or serrano peppers. And rather than water, the vinegar is mixed with oil—usually canola in the recipes I’ve seen. As mentioned, Italian cookery abounds with preserves of all kinds. Someone could write a whole book about them. Well, in fact, someone has. If you want to know more about the subject, you should really buy Domenica Marchetti’s new book, Preserving Italy. Just published, it has immediately become the definitive source in English on the subject. Cut all the vegetables into bite-sized pieces: Cut the cauliflower into flowerets, then cutting any very large flowerets into 2 or even 4. Slice the carrots into rounds, not too thinly. Slice the celery across the grain. Trim the spring onions aof their roots and most of their green tops, then if large, slice them vertically in 2 or even 4. If using pearl onions, peel them and leave them whole. If they're fresh, they should be very easy to peel, otherwise you can blanch them for a minute or two to loosen their skins. Trim the green beans but otherwise leave them whole. Slice the bell peppers into strips or bite-sized squares, as you prefer. (See our post on trimming and slicing peppers for details.) You should slice the cucumbers, like the carrots, into fairly thick rounds or, if they are big, into bite-sized cubes. You can then lay out your veggies on a cutting board. Close up the mason jars. Although quite edible as soon as you're done, it's best to let the giardiniera mellow in the fridge for at least a day or two before eating. We LOVE pickles, so we’ll be definitely trying this one out soon:) They’re excellent with taramosalata and crusty bread, as we love to serve them here in Greece on Clean Monday. Thank you for sharing this dear Frank! My aunt made giardiniera and I liked it. I remember going through phases: for a while cauliflower was my favorite component, then it was carrot, then cauliflower again. I admit I am not that good into the preservation department (I use the freezer a lot), so I doubly commend your efforts. Thanks, Simona! I’m not a big preserver myself, for the most part. But this one’s so easy! I, too, make giardiniera, Frank, and it’s a favorite among my family and friends. It contains olive oil, however, and cannot be preserved. That’s not really a problem for anyone, unless they haven’t space in the fridge for a jar or two. It keeps for months, although it rarely lasts a week. I should give your a try. I love pickled vegetables and your giardiniera offers a good mix. I have had at least 70 zucchini and counting (ready to pull the two plants). This would be a good idea for them – if they don’t get too mushy. I’ve had plenty of giardiniera in my life, but have never made it. Really should one of these days — although I don’t really can/preserve, love the idea of it. And vinegar/fermented things are SO good. Terrific post — thanks so much. 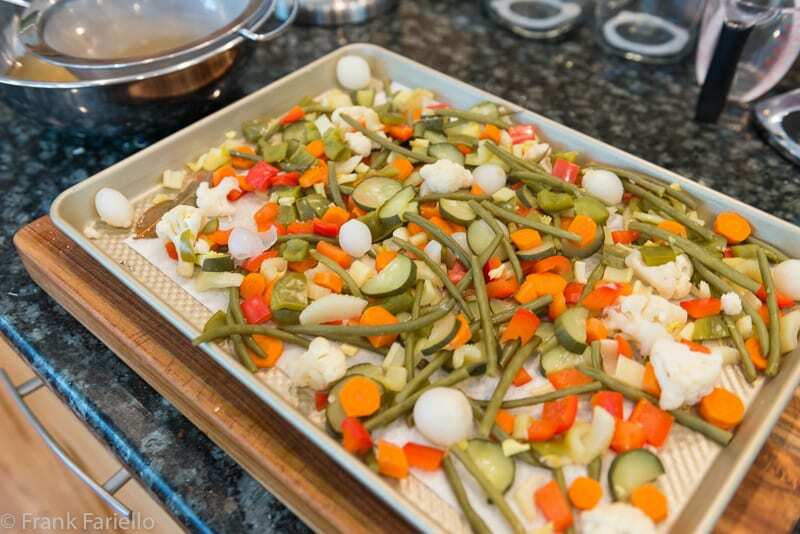 This is similar to how my Mamma used to make giardiniera. She added a small amount of tomato sauce, giving it a slight red colour. I was so relieved to see your recipe did not include tuna! Yuck! Mark loves giardiniera so I think I will make a batch. Love your choice of veggies, too! I just got Domenica’s book and am enjoying it thoroughly! quest’anno la voglio fare, grazie per aver postato questa versione, è molto invogliante ! Buon we Frank ! Grazie, Chiara. Buon weekend anche a te! Sasso vinegar really is excellent. But now that you mention it, I haven’t seen it sold around these parts, either, for some time. Funny how it’s so hard to find. I can’t wait to make this! It would be lovely home-made, served with cheese and charcuterie! As always Frank, you provide not only a recipe but historic & factual tips to make even the unfamiliar reader move forward competently. I remember my Zia preparing this each summer with the addition of fennel seeds. Could not agree more about Domenica’s book, everything you need to know at your fingertips. Hmmm, fennel seeds do sound nice. Will have to try that next time! Thanks for the recipe as I am tired of buying it. Off to the farmers market. You’re right. Homemade is so much better. Between you and Domenica, I’m determined to make my own giardiniera for eating during colder months. Having broken my wrist a month ago though, I’m a little slow on the slicing skills. But there’s still time….. Grazie Frank. Sorry about your wrist, Linda! Do feel better. Thank you! Your description of the canning process is so clear and calm that it makes the project seem quite approachable, even for someone who has never canned nor had the opportunity to learn at someone’s elbow! If I were to add green beans, should they go into the simmering mixture after the carrots? Thanks again. Thanks for your kind comment, Catherine! Making giardiniera at home really is approachable so long as you take it one step at a time. And yes, the green beans go in after the carrots. Thank you for the recipe! I’ve been wanting to make giardiniera ever since I had it at an Italian restaurant in Venice, Florida. It had just the right amount of spice and bite. YUM!! I even have some jars like yours I can use. Have a great weekend!! You’re welcome, Marisa Franca! And enjoy!